Kalypso Media has announced that Tropico 6 for PC has been delayed until January 2019, with the dictator sim releasing for consoles in summer 2019. According to a statement from the publisher, Tropico was delayed from a 2018 release date to give the development team at Limbic Studios more time to polish the title. 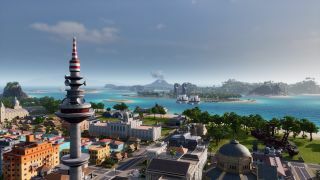 “In a statement made directly from the palace balcony, it was confirmed that Kalypso Media and El Presidente want Tropico 6 to be the biggest and greatest Tropico yet for both PC and consoles,” the statement read. Tropico is a city building/dictator sim which sees you playing as the leader of the island state of Tropico (AKA El Presidente). It’s up to you to make Tropico prosperous as the state progresses through the eras. Whether you decide to be a ruthless dictator or a compassionate statesman is up to you. Tropico 6 is the latest addition to the Tropico series and sees you having more control than ever. For the first time in the series you can manage extensive archipelagos, build bridges to connect your various islands, and make use of new transportation and infrastructure. But, if you’re more concerned about having the most impressive monument collection, you can send agents to steal world wonders such as the Eiffel Tower and the Statue of Liberty. Tropico 6 will now release for PC in January 2019 and for PlayStation 4 and Xbox One in summer 2019.